Anonymous sale; Christie's, London, 6 April 2000, lot 69. This form of label is thought to have been adopted in the 1830s by the Leeds firm of John Kendell & Co., established in 1816. The firm was taken over by Marsh & Jones in 1863 (see The Dictionary of English Furniture Makers 1660-1840, p. 505 and C. Gilbert, Furniture at Temple Newsam House and Lotherton Hall, London, 1978, p. 322). 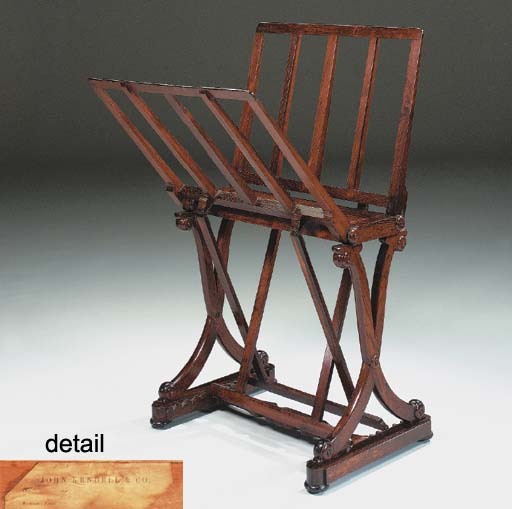 Another folio-stand bearing Kendell's label was sold by M. Foljambe, Esq., Christie's, London, 13 October 1988, lot 181 and again, anonymously, Christie's, London, 12 July 1990, lot 110.